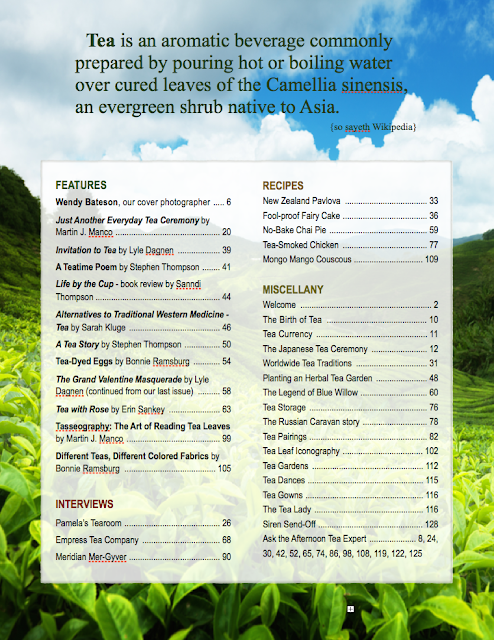 Tea Travellers Societea: 1st Annual Tea Magazine Issue is ready to roll! If you're a member of the Tea Travellers Societea, you may have wondered what this business is about a 'tea magazine.' Basically, online magazine la Vie Sirene (published by our parent company, Siren School) puts out theme-specific issues 4-6 times a year, and because of us, that now includes an issue dedicated to tea. We may even get ours in print! Here's a sneak peek at the table of contents to give you an idea of the gems you will find.